Quorn Fields was a farmhouse standing in the fields between the Soar and the main road from Loughborough. It was erected after the Enclosure awards in the later eighteenth century. 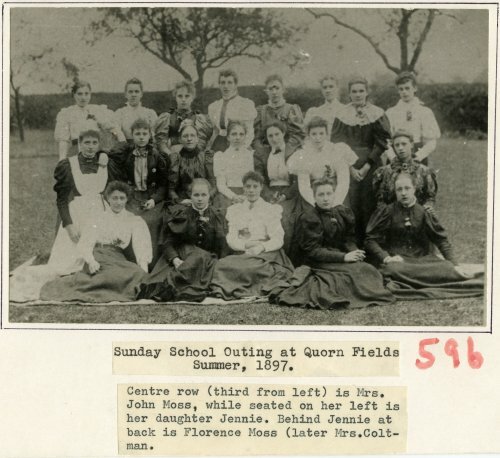 The caption reads: Centre row (third from left) is Mrs. John Moss, while seated on her left is her daughter Jennie. Behind Jennie at back is Florence Moss (later Mrs. Coltman). My great grandfather was Percy Moss. He and his father John Moss farmed at Quorn Fields. The lady to Mrs John Moss' right is possibly Frances (Fanny) Moss, Percy's wife. As far as I am aware, John and Elizabeth Moss did not have a daughter called Jennie, only Annie and Florence. The only Jennie I have come across is one of Fanny's sisters. Also, Florence married in 1895 so she was already Mrs Coltman and was later to become Mayor of Loughborough. Missing information: Can you identify anyone else in this image? Submitted by: Kathryn Paterson. Updated by Paul Moss.